Lately I cannot get enough peanut butter - my go to is PB2. I eat it throughout the day. Recently my friend sent me a copy of Blossom's Mayim's Vegan Table I went strait for the Dark Chocolate Peanut Butter Pie. I made it on a Friday night for the weekend. All day Saturday I dreamed of that pie. 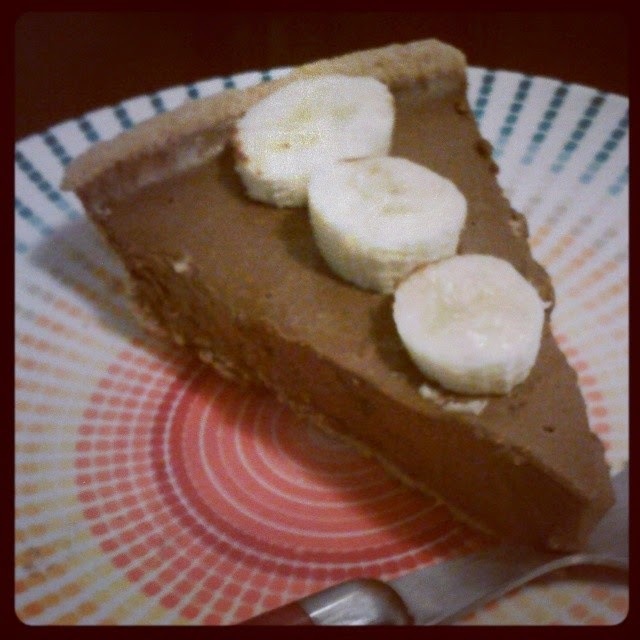 Once home, I sliced an organic banana and sliced the pie and we went to town on it! So good, so tasty and so easy. I even shared it with my neighbor who raved about it. You can buy all the ingredients (which amount to 4 unless you include bananas) at Target for about $8. The pie crust I bought (Keebler - accidentally vegan) made 8 pieces of pie making it an affordable treat. I believe this weekend calls for me to make another one.